When did you last make a backup of your Blogger blog? Imagine your blog's posts or photos were inadvertently deleted, you lost access to your account, or you made changes to your blog you could not undo - would you be able to restore your blog? Make a backup today! Your blog's posts, photos and template all need to be backed up separately. While that can be a bit of a hassle, it also means you can quickly make a backup of your blog's template before making changes or just your blog's photos. Before you start, create a folder on your computer, external hard drive or backup device to store all the files together. The images you upload to your Blogger blog are stored in your Google Photos, which can be accessed through Picasa web albums or your Google+ Photos. The easiest way to back up your photos is using Google Takeout, which lets you back up your blog posts at the same time. I've outlined how to backup your photos using Google Takeout below. As an alternative, you can also download your photos directly from Google+ or from Picasa Web Albums Google Album Archive (get.google.com/albumarchive). Note: this archive may not include videos you have uploaded directly to Blogger. If you include videos in your blog posts, I strongly recommend uploading them to Google+ Photos, Picasa Web Albums or YouTube first, then inserting the videos into you posts. Note that if your blog has multiple authors, each author will have to back up the images they added to posts from their own Google account. If you post using a Google+ Page, you will have to sign in to the Page's account directly before downloading your photos. You can include all your photo albums (which I'd recommend), or just select your blog's individual album or albums. Your images will be exported in their original upload format. 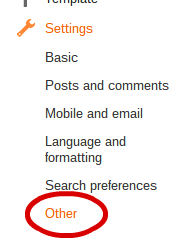 Note: at this step you can also choose to back up your Blogger blog's contents - see below. 4. Click the blue Next button at the bottom of the page. A link to the archive will be emailed to you when it is ready, or you can have the archive added to Google Drive. I don't recommend only storing your backup in Google Drive, because if you lose access to your Google account, you will lose access to Google Drive as well. Store a copy on your computer, an external hard drive or in a different account (or do all three). 7. Click the blue "Create Archive" button. When your archive is ready, Google will send you an email. Large archives can take hours or even days to create. Archives are available to download for a week. Click the "Download" button to download the archive to your computer. 9. Check the archive to make sure all your photos are there and you can open the files. There are two ways to backup your Blogger blog's posts: you can use Google Takeout or you can export a copy of your blog from your Blogger settings. Note that your blog's Blogger comments will also be exported, but Google+ comments will not. If you are creating an archive of your blog's photos, you can use Google Takeout to back up your blog's posts at the same time. 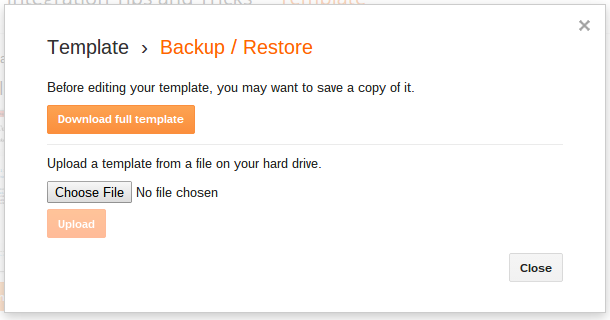 Note that exporting copy from your blog's settings is the quickest and easiest way to make a backup if you are not already backing up your blog's photos using Google Takeout. Click your blog's title, then click Settings in the left menu or using the quick navigation menu on the Blogger dashboard. Click "Other" from the Settings navigation. 3. Under Blog Tools click "Export blog"
6. Close the Export blog window when the download is complete. 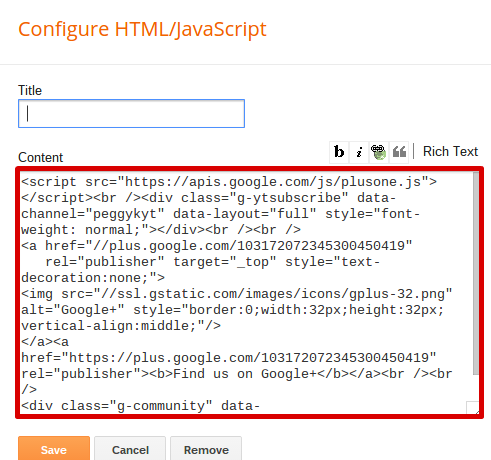 The exported xml file can be imported into another blog or viewed in a text editor. The Template sets the way your blog looks, but does not include the posts or contents of gadgets. 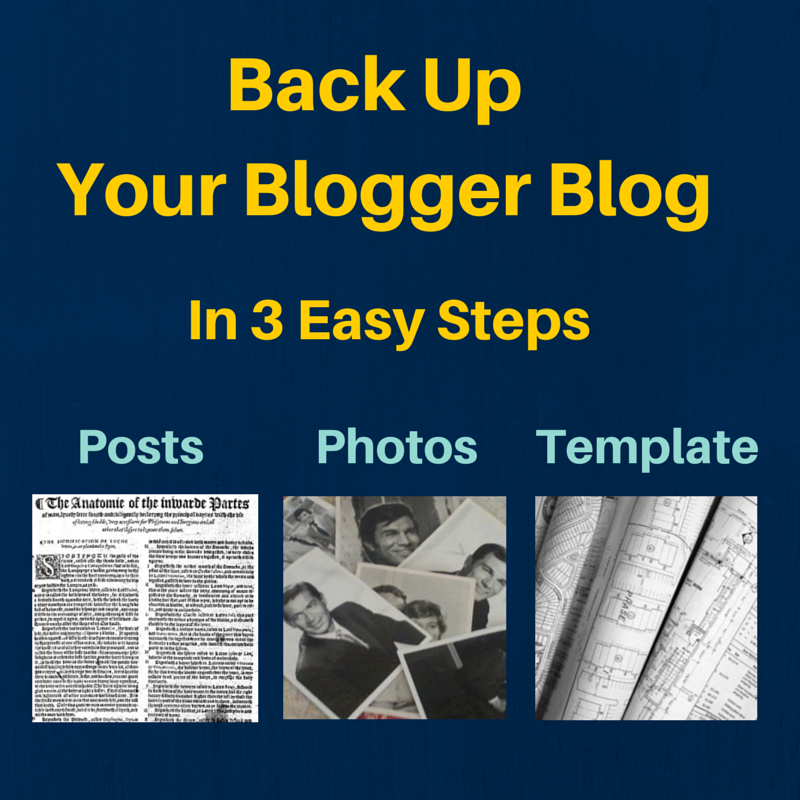 Make sure you make a backup before you edit your blog's Template! 4. Click "Download full template"
The template will download as an .xml file that you can upload to a different Blogger blog or to restore your original template after editing. If you don't want to fuss with making an organized backup of your blog's gadgets you can quickly save the HTML of your blog, which should include your blog's visible gadgets. If your gadgets need to be restored, you would need then to find the gadget code in the HTML. Store the file with the rest of your blog's backup files. If you want a more organized backup of your blog's gadgets, you can create a file with their contents. 1. Create a new text file to store a copy of the contents of each gadget. This file format should be plain text, not formatted. Online: create a draft Blogger blog post in HTML mode and paste in the gadget contents. The draft post can be backed up with the rest of your blog. 4. If you have a Links List or Blog Roll gadget, you will have to copy each individual link in the list into your document. Hopefully you will never need to use these backup files. But if your blog is inadvertently modified or deleted you will be happy you created them.